The 3.5mm headphone port and the Lightning jack are the Brangelina of smartphone components. It seems like everyday there is a new rumor of their split in the upcoming iPhone 7, a move that would lead to the demise of one and the rise of the other. And today's no exception. Another set of images has surfaced on Chinese social networking site Weibo that appears to show off the standard set of iPhone EarPods, but with a Lightning cable in place of the 3.5mm plug. This isn't our first exposure to these purported, refreshed buds. A similar looking set surfaced in March of this year, but they look ever so slightly different. Another report seems to indicate that these headphones, if real, would be optional and the 3.5mm jack will see another day in the next iPhone. As you can see, these rumors really are all over the place. The Lighting connector seen in the below leaked image shows off the sharp plastic edge detailing that Apple introduced alongside the iPhone 5 and is still in use with the iPhone 6S. 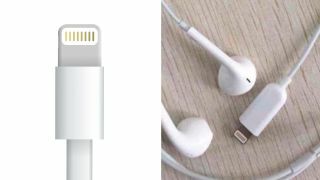 Oddly, the latest potential leak of the next iPhone's Lightning headphones seen at the top of the article rocks a completely new design, which could either point to an incoming change in accessory aesthetic from Apple, or it could be the only proof needed to show that it's a fake. After all, this sort of product wouldn't be the hardest thing to fake. Not to go so far as to say that this is, indeed, a fake, but in a world where people go to the limits to psyche out Nintendo NX hopefuls, I imagine that someone with enough free time and a will to convincingly mesh together some cables could easily whip this up. The Moto Z and Moto Z Force beat Apple to the punch in regards to excluding the 3.5mm port, but we'll have to wait until September to see if it follows suit with its batch of ports.